Matt is in the New Forest taking part in an inventory of trees. Ellie is in Inverness-shire seeing what industrial-scale timber production looks like. In this programme the focus is on our forests. Matt is in the New Forest taking part in the biggest inventory of our trees ever undertaken. He also takes to the heights with climbers from the Forestry Commission as they undertake a wildlife survey high in the treetops. Ellie is up in Inverness-shire seeing what industrial-scale timber production looks like. She also looks at new scientific research that shows the impact of forestry activities on native red squirrels. Sean is in Stirlingshire exploring the Scottish tradition of hutting, and he hears about the part these houses in the woods played during the Clydebank Blitz during World War II. John is in Kent looking at the revival of working with horses in forests and learns that it is because they are less damaging to the environment than machines. He also meets the top-rated artist whose magnificent woodcuts of forests capture perfectly the spirit of these magic places. In a step away from the woodlands, Adam meets the farmer who has found a new market for his male goats due to the rising demand for goat meat. Charlotte Smith is looking at claims that across the country we are not planting enough trees and what that might mean for the UK's timber industry. Still in the New Forest, Matt catches up with Ben Ditchburn from the Forestry Commission to find out all about the UK wide survey that Ben and his team have been working hard on for the last 5 years. The National Forest Inventory is the first of its kind, with every inch of forest and woodland being meticulously mapped to provide a modern `Domesday Book’ of the nation’s tree cover. Charlotte Smith is investigating claims that the UK is cutting down more trees than it is planting and looking at the problems this could cause both environmentally and for the timber industry. She also visits the site of the biggest proposed new forest in the UK for 20 years, but why aren’t they planting yet? Sue Scullard is one of the most highly regarded wood engravers in the country and John Craven is at her home in Kent learning about her inspiration, her craft and maybe even having a go at it himself. Sue’s pieces are beautifully crafted over hundreds of hours, often on a boxwood block no larger than a postcard. When it comes to forestry, bigger means better, and Ellie Harrison is up in Inverness to see some of the biggest machines working in the 21st century forestry industry. Ellie is at Culbin forest where giant trees are felled and stripped in one swift movement. Circular saws the size of cars split huge tree trunks like matchsticks and futuristic cranes move the timber around the woodland with ease. Matt Baker is in the New Forest monitoring one of the most elusive birds of prey found in the South East. He meets Forestry Commission ranger Andy Page, to find out about Goshawks in the New Forest and how their numbers have been doing so well in the area. Andy has a very novel way of keeping an eye on these birds, which Matt discovers later in the programme. Sean Fletcher is up in Stirlingshire to enjoy the more simple things in life. In a forest, just fifteen minutes from the centre of Glasgow sits an unusual group of ramshackle buildings. Some brightly coloured, some in need of a little TLC, but all of them made of wood. This is Carbeth, a decades old community of “hutters” close to the city but a world away in time. Spring lambs are something most Country File viewers will be very familiar with but what about spring goats! Goats milk is just as versatile as cow's milk and has health benefits for those of us who are lactose intolerant. There's also a growing market for goat's meat. This week Adam's investigating both! John Craven is in Kent meeting some magnificent horses and their handler Frankie Weald. John isn’t just here to take in the landscape though; he has come to this ancient woodland to help out. 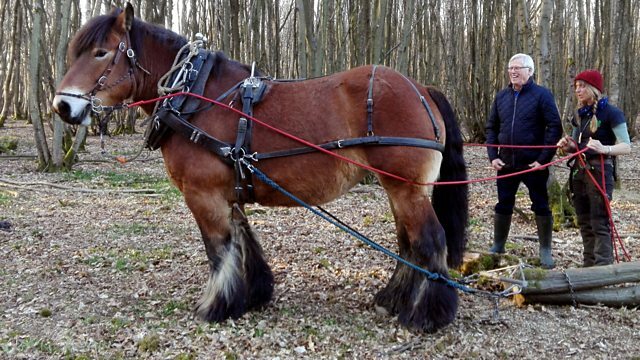 It’s a sight straight from the pages of history; a magnificent Ardennes horse, with traditional harness pulling logs out of an ancient coppiced clearing. John is just in time to have a go with not just one, but three of these wonderful horses. Ellie’s in her element up in the forest around Inverness, when she gets the chance to get up close to red squirrels. She meets PhD student Louise de Raad and Forestry Commission’s Kenny Kortland. Louise is undertaking the first ever scientific study of its kind… looking for evidence of the impacts of forestry on red squirrel populations. It’s still early days for the study, but it will hopefully pave the way for essential forestry work and wildlife conservation to move forwards together. Matt’s high up in the canopy seeing the work of Andy Page, Forestry Commission ranger, who’s climbed a rather tall tree, all in the name of wildlife monitoring. He is set to place a tiny camera into an inactive Goshawk nest, with the hope that this will be inhabited by mother and chicks in the months to come. Now is the time to act, before any eggs have been laid, and this little camera could provide a fantastic source of data for scientific research, as well as amazing footage.